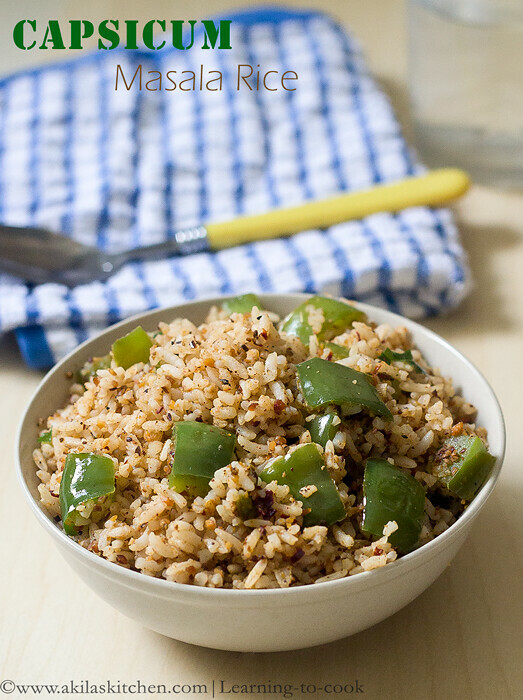 Masala Capsicum Rice is an easy lunch box rice recipe which is bit spicy and tasty and can be prepared in just 10 minutes. The spices are roasted and ground and add to the rice, which gives a nice flavor to the capsicum rice. 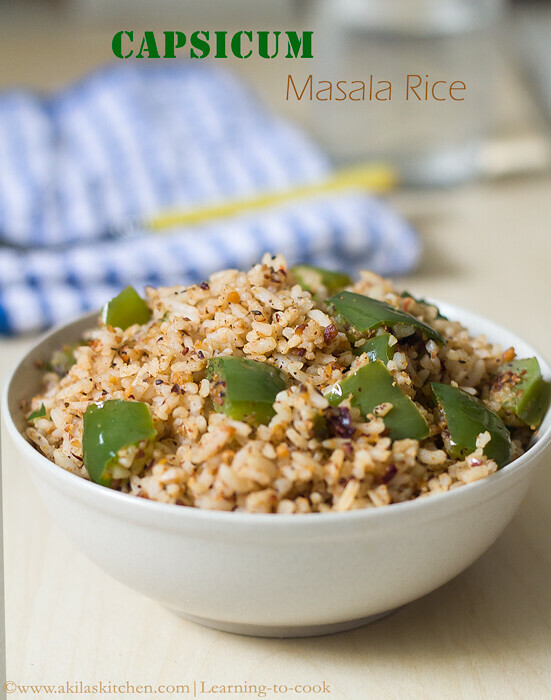 Masala Capsicum rice with easy step by step instructions for your easy understanding and learning. I wanted to try this Capsicum Masala Rice for a very long time, but some how I didn’t find time. Last weekend I tried this finally. 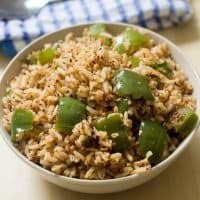 This is so easy to make recipe and the crunchiness in the capsicum makes the rice even more tastier and the fresh ground masala makes it more aromatic. Everybody in our family loved it lot. Here is the recipe for the easy recipe to make the rice. 1. Wash and cut the capsicum in cubes and keep ready as shown below. 2. Take the ingredients mentioned in fry and grind and dry fry them. Take care not to over fry them, as you may get bitter taste. 3. Fry them till you get a light brown colour in low flame. Grind them to a coarse powder. 7. Serve the hot not masala rice with papad. 1. You can even add 1/2 tsp of black pepper for extra spiciness. 3. One of my friend suggested to add the toor dal also. Haven’t tried it yet. 4. Before serving, you can also add a tsp of ghee, which tastes great. 5. Rice quantity can be adjusted according to your taste and spiciness. This is so easy to make recipe and the crunchiness in the capsicum makes the rice even more tastier and the fresh ground masala makes it more aromatic. Everybody in our family loved it lot. Wash and cut the capsicum in cubes and keep ready as shown below. Take the ingredients mentioned in fry and grind and dry fry them. Take care not to over fry them, as you may get bitter taste. Fry them till you get a light brown colour in low flame. Grind them to a coarse powder. In the wok or kadai, add oil and when hot add the mustard seeds and curry leaves. When mustard seeds splutters, add the capsicum and little salt. Sauté them. (Just 2 to 3 min). Add the rice, mix it and check for the salt. 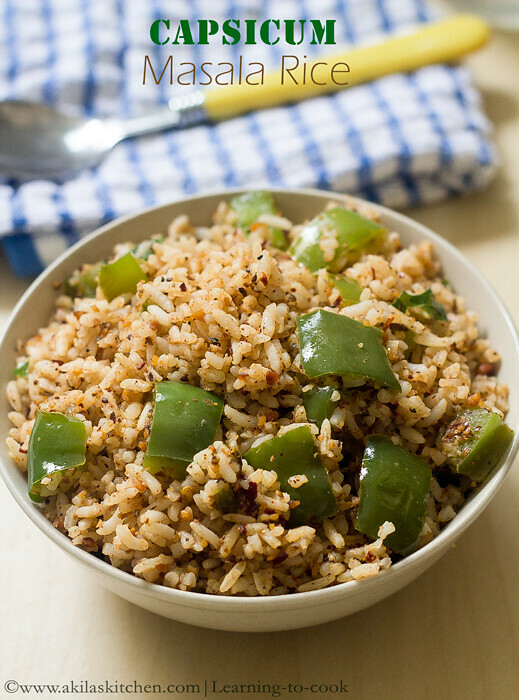 Serve the hot masala capsicum rice with papad. You can even add 1/2 tsp of black pepper for extra spiciness. You can also add the fennel seeds and grated coconut while frying for extra flavor. One of my friend suggested to add the toor dal also. Haven’t tried it yet. Before serving, you can also add a tsp of ghee, which tastes great. Rice quantity can be adjusted according to your taste and spiciness. *Post first published on Nov 8th 2014. Updated with recipe. Simply visit http://www.erecipe.com or contact me at [email protected]. We look forward having you in our network! A simple and delicious masala rice!